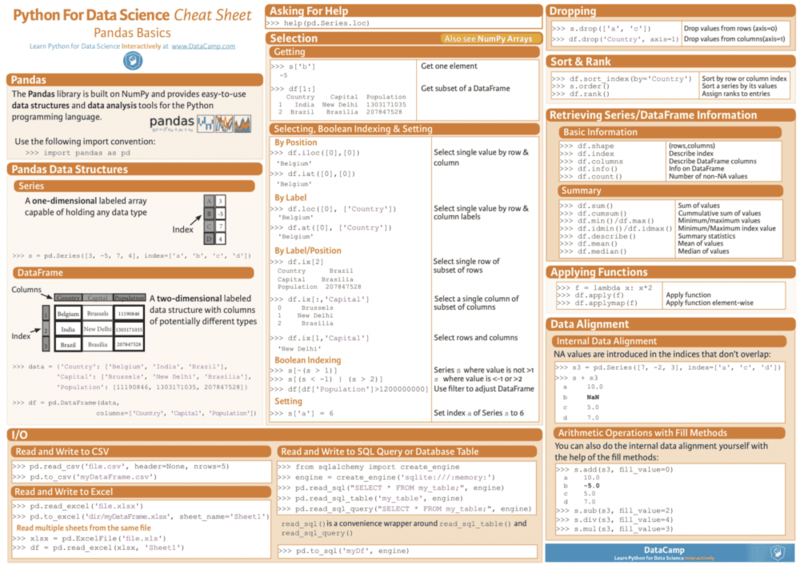 The cheat sheets also include code to implement them in Python, also for algorithms, a quick overview of math is also displayed. One of the most popular languages, Python is known for its versatility. To understand the basics of this programming language, DataCamp has developed this cheat sheet for beginners to understand and implement the right syntax for their day to day tasks. It consists of dealing with strings, lists, numpy and other operations which are a core part of the development of machine learning models. When it comes to opting the right estimator after the data processing task while building the model, it can be difficult to choose one. The flowchart from sklearn gives you a brief idea about how to start with choosing the right one. If you are a beginner or practising data science on unique datasets by participating in hackathons, you can make use of this to test your results. 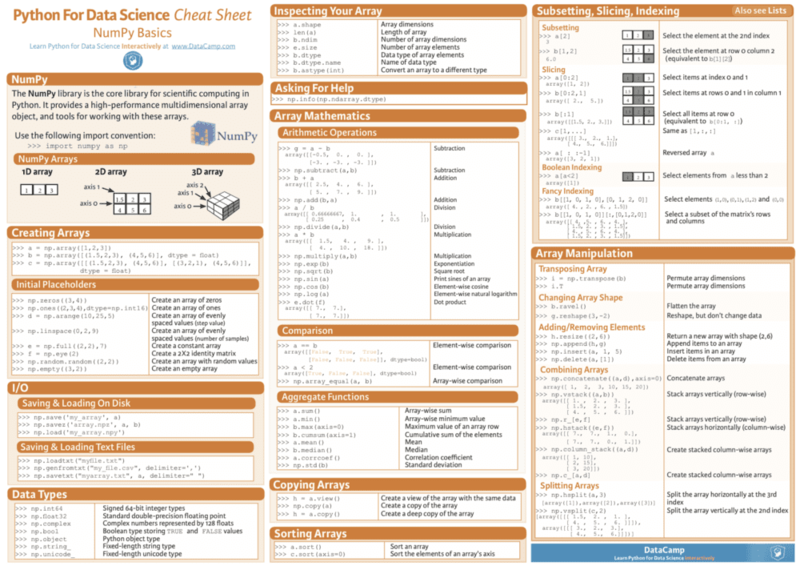 Numpy stands for Numerical Python, as the abbreviation suggests, Numpy library is used for mathematical computations such as matrix multiplication, array segmentation, various arithmetic operations and so on. With this cheat sheet one can understand and remember the graphical structuring of data in the dimensional matrix. 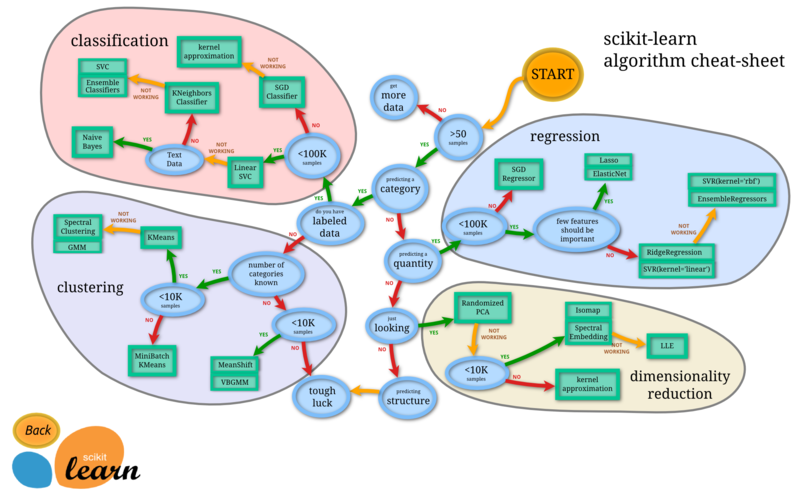 The key to learning data representation in data science is to visualise them. 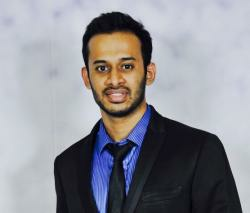 Pandas is a library in Python for data manipulation and dealing with time-series data. 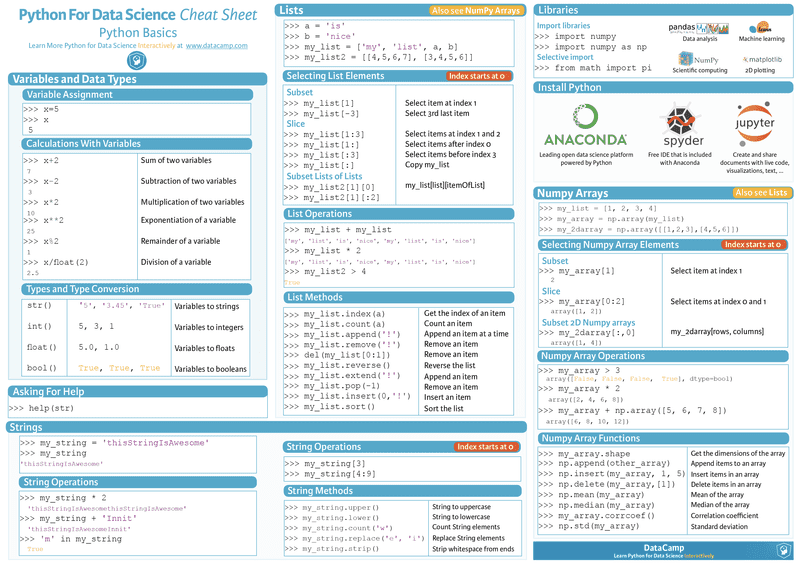 This (cheat sheet) library helps one to import various kinds of structured data and visualise them. This is a free software released under the three-clause BSD license. Tasks such as concatenation, merging of multiple data, indexing, conversion and extraction data from time-series are easily processed with help of this library. Matplotlib is a data visualization library for plotting various kinds of graphs. 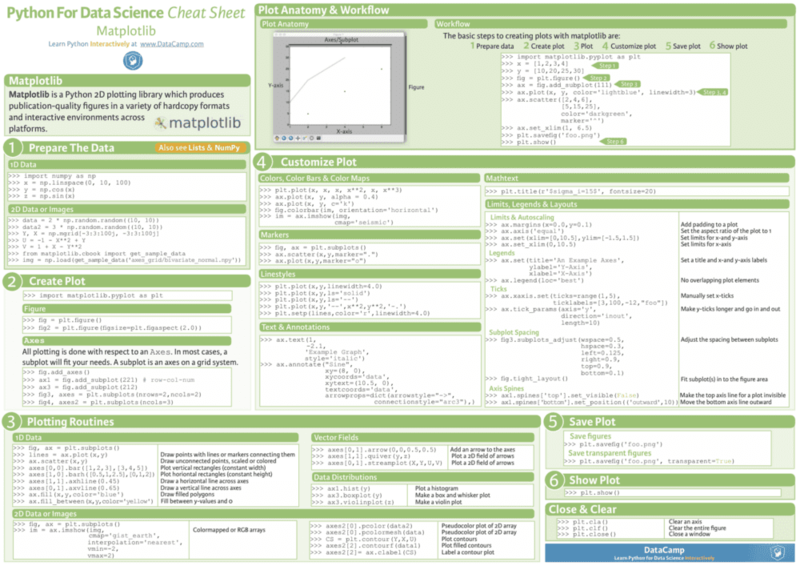 This cheat sheet will help one to understand the different types of graphs that can be implemented. Also visualising in Jupyter Notebook looks great, and this browser-based platform makes everything look nice and easy for a data scientist. The cheat sheet can be accessed here. 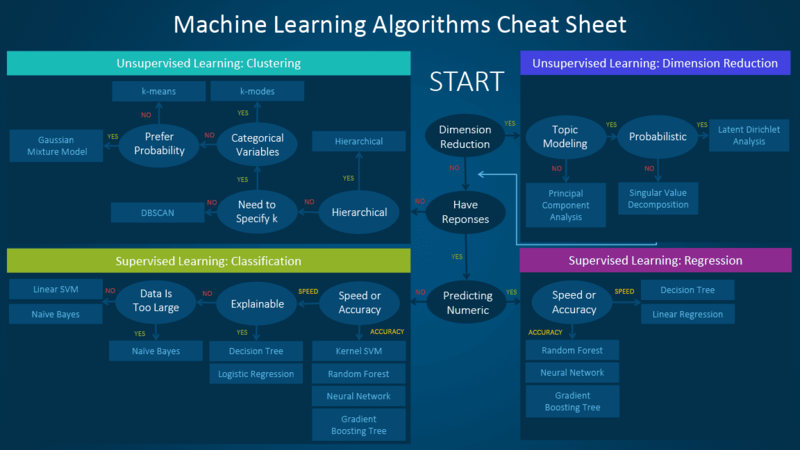 SAS has posted this cheat sheet on their blog, this is a flowchart-based cheat sheet which helps one to walk through the various steps involved in option for the right algorithm. Also, it gives a brief description of why this algorithm must be chosen depending on the dataset you have and the problem statement. Keras is developed by Google on top of the Tensorflow library. 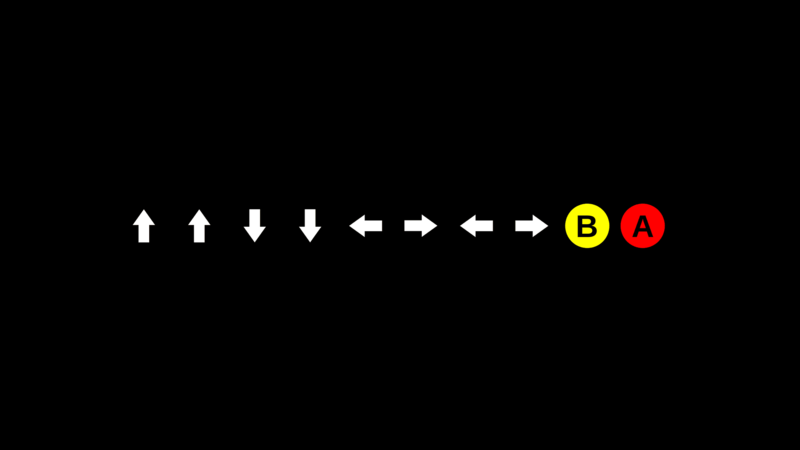 This cheat sheet includes various techniques involved in building a neural network. Keras is a library with surface level implementation but does not have the computing nature like Tensorflow. But one can definitely make use of this to build quick and fast neural networks and those who do not like to dive into building skeletons for models. 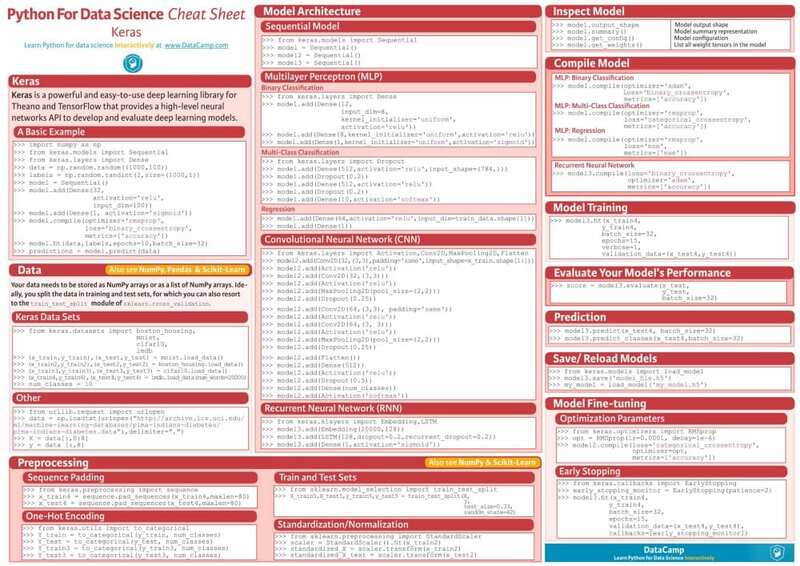 All of these cheat sheets come in handy while developing models by Data Scientist. A quick gist is all it requires to save time and to remember these concepts on your fingertips. These cheat sheets provide the right quantity of information to keep oneself updated and come handy during the learning journey.